The Sennheiser IE 80 S In-Ear, Noise-Isolating Headphones are designed to offer an audiophile experience in a highly mobile and compact form factor. A reinvention of the IE 80, these earphones provide dynamic drivers that deliver an accurate sonic picture, a clearness of sound, and a wide-ranging frequency response. Aesthetic improvements abound as well, including a stainless-steel design complemented by a red-colored strain relief on the right earphone connector; this allows you to easily distinguish headphones, so you'll always know which ear is which. These earphones come with three different types of ear tips to better suit your individual needs. Each type of ear tip is available in small, medium, and large sizes. Ear hooks have been supplied to situate the IE 80 S close to your ear canal to create a seal in the ear, which can reduce ambient noise by as much as 26 dB. This also helps to improve bass response, allowing you to listen at lower volume levels without missing out on the details in your music. You can also use these earphones without the ear hooks. The earphones come with a tool that allows you to adjust the frequency response to suit your personal taste. 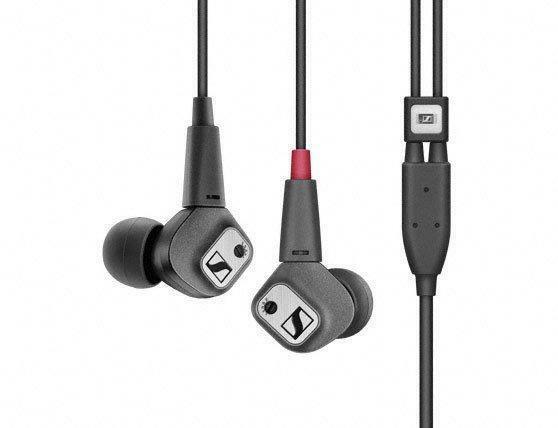 A detachable cable provides plenty of slack, connecting to the earphones by means of Sennheiser's proprietary two-pin connection. The cable terminates in a 3.5mm stereo mini plug to interface with most consumer analog media players. A tool for cleaning the earphones and a hardshell case are included to help keep your headphones in good working condition for years of enjoyment. The headphones' lightweight design is ideal for travel. The compact housings contain dynamic drivers, which deliver an accurate sonic picture and a wide frequency response. The headphones come with latex-free silicone and lamella ear tips, each in 3 different sizes, as well as Comply foam ear tips so you can find the perfect in-ear fit. A proper fit creates a seal in the ear to reduce ambient noise by as much as 26 dB. This also helps to improve bass response and allows you to listen at lower volume levels without missing out on the details in your music. Optional flexible ear hooks are included for a secure fit. The 3.5mm stereo mini plug offers compatibility with a wide variety of MP3 players, CD players, laptops, tablets, and more. A cleaning tool and storage case are included to keep your headphones in great condition for years of enjoyment.